Inflections are word elements that indicate grammatical relationships among the words in a sentence. For example, the verb walked is in the past tense; we know this because of the inflectional ending -ed. The noun girls is plural. We know this because of the s that has been added to the singular word girl. The low incidence of inflections in English requires speakers to pay attention to word order. In Latin, on the other hand, word order hardly matters. Take nouns as an example. In Latin, nouns have special forms, according to whether the noun is being used as the subject of a sentence, the direct object, the indirect object, a complement, a noun with a built-in preposition, a possessive noun, or a noun of address. In English, except for possession and number, a noun is a noun is a noun. If we look at the English word girl out of the context of a sentence, we know it’s a noun, but we can’t tell anything else about its grammatical function until it is used in a sentence. If we look at the Latin noun puellam (girl), we know that it is the direct object form. The form puella is a subject form. Puellae is genitive (possessive) form meaning “of the girl.” Because the inflections are “built in,” their order in a sentence doesn’t much matter. 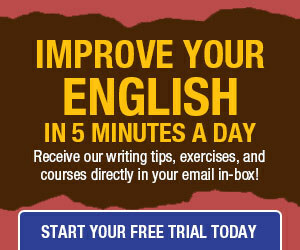 In English, however, word order tells us if a noun is a subject or an object. If it comes before the verb (usually) a noun is a subject. If it comes after an action verb, it’s an object. Then there are the adjectives. Latin adjectives have to accord with the nouns. To say, “The big boy loves the pretty girl” you write: Puer magnus puellam bellam amat. To write, “The pretty girl loves the big boy,” you can leave the words in the same order, but you have to change the endings to show function and gender: Puella bella puerum magnum amat. Because English retains so few inflections, it is a little surprising that so many of the errors we discuss on this site have to do with the few inflections that do remain. The boys’ backpacks were stolen. (plural noun, s’). The girl climbed Mount Everest. The girls climbed Mount Everest. Regular verbs are inflected to show past tense by adding the suffix -ed: talk, talked, (have) talked. 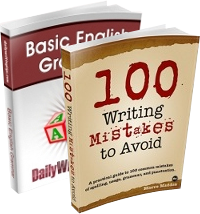 Errors occur with verbs that indicate past tense by changes in spelling, for example, write, wrote, (have) written. See the DWT post Beware of the Irregular Past Participle. Because pronouns have retained more inflected forms than nouns, they are the source of probably half the grammatical errors made by native speakers. For more on pronoun case, see All Pronoun Cases Are Created Equal. Possessive forms are of two kinds: those that stand for a noun (possessive pronouns), and those that stand before a noun to show possession (possessive adjectives). The pronouns you and it present no problems because they are the same in both their subject and object forms. Wrong: The house is having it’s roof replaced. Correct: The house is having its roof replaced. Wrong: Every scout will do their duty. Correct: Every scout will do his duty. Adverbs are also inflected to show comparison. Adverbs that end in -ly are inflected by adding more and most in front of them: happily, more happily, most happily. Note: Some authorities regard the comparison of adjectives and adverbs as word formation rather than inflection. Right. However, it’s better to know that the “singular they” is widely accepted in the British English nowadays. OK, have to say it. Most inflections are caused by blacteria or vliruses. Avoid dirty words. There.